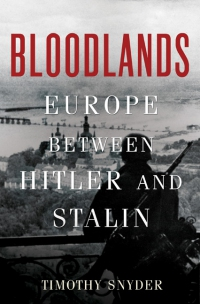 The other day I had the had the fortune of seeing an excellent lecture by Timothy Snyder, Professor of History at Yale University, in support of his book Bloodlands: Europe Between Hitler and Stalin. I’ll admit I just happened to see someone tweet a link about the lecture and I decided to go on a whim (I do love history though). Social justice and human rights are very close to my heart and I figured that hearing this lecture by such a reputed scholar would give me some good insights into a historical event that has been much publicized. And it did. Deliberate murder of 14 million non-combatants. “Bloodlands” refers to a geographic are. A strip in Eastern Europe where most of the killing happened. The area where Nazis and Soviets were both present. We separate histories by nationality and ideology, when really this is one story. “We” Questions are good for moral inquiry. It’s a fallacy to refer forwards in history when making arguments about what happened. Ex. Right now I can’t argue my behaviour as impacting what I don’t know will happen in 10 years. Ideological battles don’t “cancel” each other out. The clash of Nazi Germany and the Soviets didn’t cancel each other out; they accumulated. Book has a focus on territory instead of the two opposing sides. Ideology always has a link to economy. Germany conquered for imperial purposes. Soviet exploited it’s current territory to catch up and modernize. Each Nations’ world was closed off by British Navy. They had to attack Eurasia to achieve their goals. Ukraine was a common land to conquer. Poland was a problem for both nations, hence it was invaded jointly in ’39. Poland was like a “homeland” for Jews numerically. The Great Terror in Russia was predominantly against peasants and national minorities. If one survived the Gulags, then they were usually killed upon returning. Soviets didn’t want anybody to speak out against their regime. 1939 was the destruction of states. State -> statelessness is always worse for national minorities. Nazis scaled down their starvation and scaled up the “Final Solution”. Germany couldn’t starve out eastern Europe because they weren’t self-sufficient in food production. 14 million is a number. But each of those 1’s is a unique, loved, and special individual. We must listen to the stories. Professor Snyder was an excellent lecturer. He delicately worked his was through his material while giving clear, insightful commentary along the way. He presented his material with an excellent balance of appeal to the logos, ethos, and pathos. I could tell that many in the audience were very well-acquainted with the subject and held on to every word he said with nods of affirmation and inaudible gasps of affirmed knowledge. At the same time, he wasn’t overly esoteric with his language. This way the typical history student (like myself) was equally engaged with his well articulated arguments and seamless story telling. Snyder argued how he doesn’t like to segment histories into neat little packages with clear boundaries. Although it’s a useful tool for memory and organization, it doesn’t do the story justice. 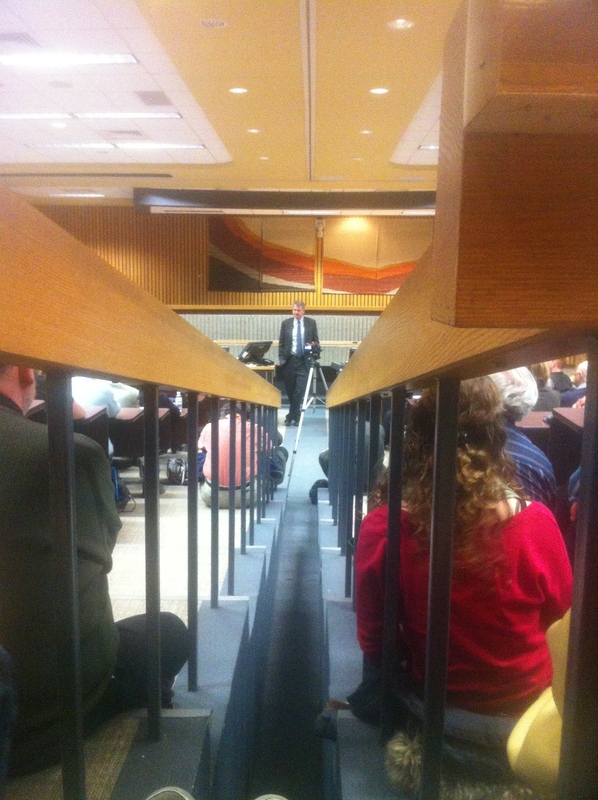 I was particularly intrigued on his ideas about the role of territory and geography. So often in history, the story stops where the national border does and then a new story starts with another nations version. Snyder debunks that idea. Along the same lines, he argues that just because events may be separated by time, they can still be closely connected. Here he referred to the Ukrainians telling their story about the forced starvation in 1933 and later again in 1941. The final point I want to mention is how Professor Snyder made the interesting observation about how the tale of the deaths camps has become canonical when really it was exceptional. The vast majority of Jews were killed close to their homes, but for some reason we have come to see the concentration camp as the symbol of death. A person in a concentration camp at least had a chance to survive and live to tell their tale. Those murdered in the streets or in their homes never got that chance. My take on that is that the concentration camps are places that are still physically standing. They serve as a tangible memorial to the deliberate extermination policies. One can’t look at a street or home and say the same thing. Overall, I was very glad to have the chance to see this lecture. It makes me want to see more speakers. I always LOVED going to my history classes in university. Maybe I’ll do that. I don’t even care about credits. Maybe I’ll just sit in on classes and absorb what there is to know.